Jamie Kirby is a band director and music teacher at St. Paul the Apostle school in downtown Spartanburg, and has previous experience teaching in Laurens District 55, at Union Christian Day School, and at Lake View High School in Dillon County. He has a BM in music from the University of South Carolina and a MME from Winthrop University. Jamie has performed in the top concert ensembles at USC and Winthrop and was featured as a soloist with the Mighty Sound of the Southeast marching band at USC. Currently, Jamie performs with the Sparkle City Brass, a professional brass quintet, and also performs frequently at various gigs in the area. Jamie’s students have a proven history of success. 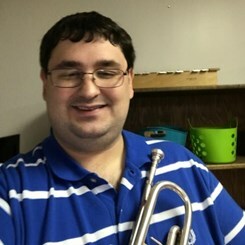 He has had multiple trumpet students selected for the South Carolina All-State band and Region bands. Also numerous students have received superior ratings at the annual Solo & Ensemble festival. His bands have received superior and excellent ratings at various competitions and festivals.